The Cumberland & Dumfriesshire Farmers Mart P.L.C. had forward 2,069 store hoggs & feeding ewes, also 181 breeding sheep at their weekly sale at Longtown on Tuesday 23rd March 2010. Store hoggs were as dear with quality poorer. Top was £83.50 for Leicesters from Riggheads; Texels £80.50 Haithwaite, £78 Cottage Farm; Suffolks £71.50 Shaw of Dryffe; North Country Cheviots £78.50 Browtop, £77.50 Candybank; Greyfaces £72.50 Hesket House, £71.50 Blackhouse; Hill Cheviots £66.50 Sundhope; Cheviot Mules £67.50 Oliver Farm; Charollais £66.50 Hesket House; Blackfaces £58.50 Ingram Farm, £51.50 Carwath; Swaledales £56.50 Roachburn, £49 Haithwaite; Herdwicks £68.50 Haithwaite. Cast ewes £87 from Carwath who also sold Hill types at £63. Breeding sheep were very easy to sell. 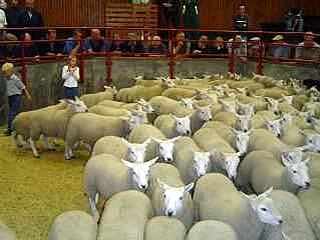 Top was £76, £72 for inlamb Blackface ewes from Milnmark. Mule ewes with twins to £48 each Becklees.